The world of statuary , sculptures, fountains and more. Nineteenth century art instruction often included the use of sculptural models, known as drawing casts to emphasize the study of form and the visual effect that light and shadow had on these forms. A recent resurgence of interest in the use of these aids to teach art fundamentals has inspired Statue.com to create a set of 10 pristine, geometric shapes. Cast in a durable resin compound and finished in museum white, these solid forms will maintain their crisp edges long after their plaster counterparts have chipped and faded. Statue.com is proud to offer this high quality set as tools of the trade, maintaining the high tradition of a classical art training. Artists, Teachers, Designers and Decorators alike will appreciate the beauty in pure geometry. These shapes may even be displayed as accents of sculptural form and balance. Along with geometric shapes, we offer a fine line of drawing masks. Like the geometric shapes these masks are hand finished and special attention has been made to detail , we are casting them the same way that has been done over 100 years ago, using the same art grade plaster as the masters. We believe this mask to have been taken from one of the original Apollo sculptures. The Apollo Belvedere represents one of the great legacies of Greek art. It was a Roman copy, probably of a bronze original made by the Athenian sculptor Leochares, who worked for Alexander the Great, around 320BC. The Apollo Belvedere was discovered in the late 1400’s near Rome, and has been in the Vatican since 1511, in the Cortile del Belvedere, from which it gets its name. 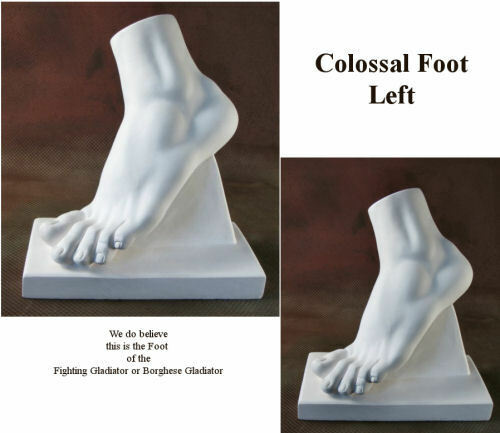 One of our most popular drawing casts is the Colossal Foot. We have reason to believe it is the foot of the Fighting Gladiator or the Borghese Gladiator Sculpture that can be found in The Louvre. The Borghese Gladiator – originally part of the Italian collection whose name it bears – is actually the depiction of a fighting warrior. The detailed sculptural composition of tendons, muscles and bones makes it a perfect drawing cast. To view more drawing casts head on over to our website . If you have something in mind but cannot find it on the website, feel free to contact us. Our excellent products coupled with our outstanding customer service ensures Statue.com is the best business for statuary and other fine goods. Reach us by phone Monday through Friday 8:00 a.m. to 6:00 p.m. (CT) 618-692-1121 or Toll-Free at 877-675-2634. Our fax number is 618-692-6775. Send mail to us at: Statue.com, Inc., 100 N. Main St. Edwardsville, IL 62025. We Embrace Earth Day, Every Day! Happy Earth Day! Here at Statue.com we feel as though it is important to take our Mother Earth into consideration every day. We are making great strides to go green. As a result, we are in the process of phasing out the marble bases of the Eleganza Collection in favor of locally grown and crafted wood. Far less energy is expended to convert our bases from tree to finished product. Fewer resources are also used as the bases are not shipped from overseas. Many of our trees come from yards as a result of storm damage – really, it’s a good thing. The Eleganza Collection is exclusive to Statue.com. No where else will you find the hand crafted beauty and grace of this gallery of sculptures. Head on over to our website to view our other fine galleries of sculptures, fountains and garden accessories. If you have something in mind but cannot find it on the website, feel free to contact us. Our excellent products coupled with our outstanding customer service ensures Statue.com is the best business for statuary and other fine goods. The computing world has been abuzz lately about Heartbleed and the vulnerability of websites leaking passwords and other information. Heartbleed is not a virus but rather a wormhole in the OpenSSL library, widely used to implement the Internet’s Transport Layer Security (TLS) protocol. Whoa! Talk about technical. So, what does this have to do with Statue.com? We wanted to assure past and future purchases with Statue.com are secure. This security also extends to passwords and other account features with Statue.com. We have thoroughly investigated if we are Heartbleed vulnerable. Hooray! We are relieved to say there is no vulnerability. If you have any further questions please be in touch! We hope you head on over to our website to view our fine gallery of sculptures, fountains and garden accessories. If you have something in mind but cannot find it on the website, feel free to contact us. 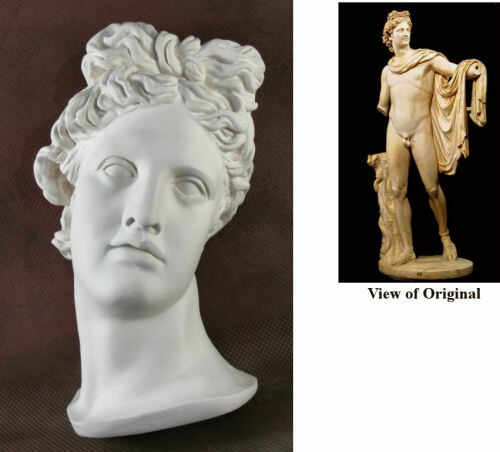 Our excellent products coupled with our outstanding customer service ensures Statue.com is the best business for statuary and other fine goods. 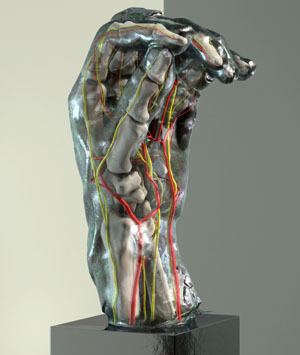 A rendering of Rodin’s Left Hand of Eustache de St. Pierre, in which you can see virtual blood vessels and bone. We love, love, love the idea of the newest exhibit on display at Stanford’s Cantor Arts Center. The exhibit diagnoses eight of the ten hands sculpted by Auguste Rodin. The hands were diagnosed by a Stanford School of Medicine hand surgeon for malformations and diseases. The exhibit combines the world of medicine and art in the most fascinating form. Not familiar with Rodin’s work? Rodin was intrigued by the human form. Most of his sculptures consisted of hands or the naked form. There is something sensual and romantic about his sculptures but technical and meticulous as well. 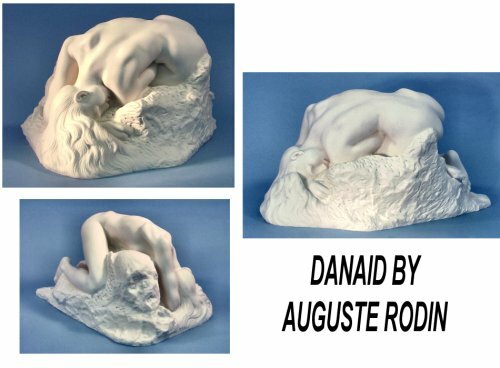 To view more Rodin sculptures head on over to our website . If you have something in mind but cannot find it on the website, feel free to contact us. 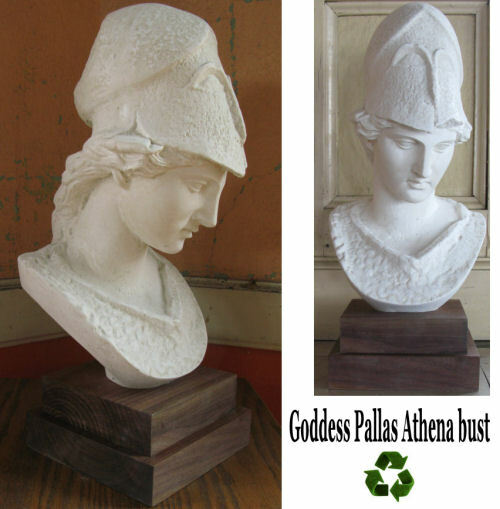 Our excellent products coupled with our outstanding customer service ensures Statue.com is the best business for statuary and other fine goods. What are your thoughts on the exhibit? What is your favorite Rodin piece? You know what they say about April Showers, right? They encourage those May flowers. In honor of April Showers we are discounting our entire gallery of fountains. Be sure to head on over to our website to view our fine gallery of sculptures, fountains and garden accessories. If you have something in mind but cannot find it on the website, feel free to contact us. Our excellent products coupled with our outstanding customer service ensures Statue.com is the best business for statuary and other fine goods. Join us on our quest of discovering enriching information regarding the world of sculpture and home decor.